For the last year or so, I have searched high and low for these candies, only to find out (to my extreme disappointment) that they seem to be extinct. See the difference? The top cigarette is crumbly and lumpy. The flavor has a bit more of a potent, extremely unnatural mint aftertaste. But the worst feature about this stick is that it dissolves into a nasty paste that coats your mouth and leaves your tonsils feeling oily. It also causes that strange sore-throat feeling of too much sugar forced down the ol’ esophagus. See? Chalky and overly crumbly. They just don’t even look fun to eat, now do they? And this brings me to Frozen Run. You see, I have been looking for the taste of Necco Candy Cigarettes, and I’ll be dipped in blueberries if Frozen Run doesn’t taste almost exactly like the stuff, albeit with a kick of refreshing moisture and a dash of carbonation. I found Frozen Run quite by accident. We were at a Travel Stop in the middle of Pennsylvania. I love regional gas stations, and am a sucker for any Stuckey’s within a fifty mile radius. I stop at Ozark Mountain Stores, and Nostalgia Palaces, and even Wall Drug. There’s almost always something cool to be found in these places; some regional food or soda that you can not get anywhere else. 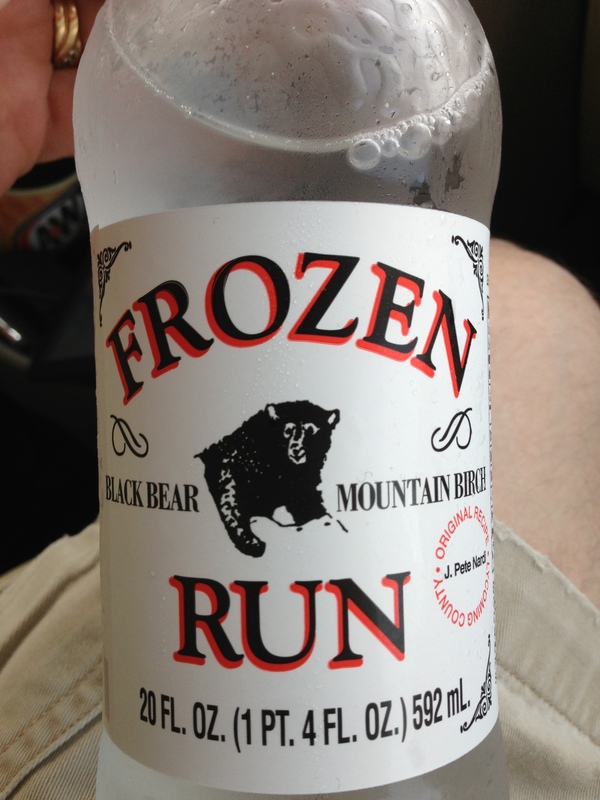 It was at this place, a lonely truck stop along the Pennsylvania highway, that I found Frozen Run. At first I wasn’t interested. It was a clear, colorless beverage with a plain, generic wrapper on it. But when I looked closer, I saw that this plain generic wrapper had a flippin’ BEAR on it! Not only that, but it was billed as: Black Bear Mountain Birch. Oh yeah, baby! Black bear mountain birch?!?! Are you kidding me?!? I had to have it. I mean, how can you see this thing and not have to taste it? 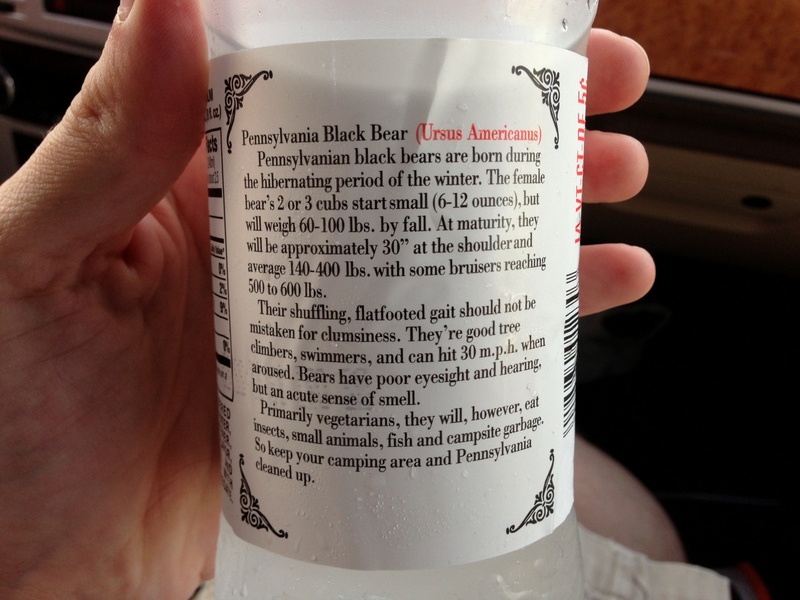 So now you have a soda that has a National Geographic-style blurb giving you facts about the Black Bear, and then you have instructions for camp safety that would make the Boy Scouts satisfied. Aww, that takes me back. I know what you mean. Remember the birch, Johnny? I remember. 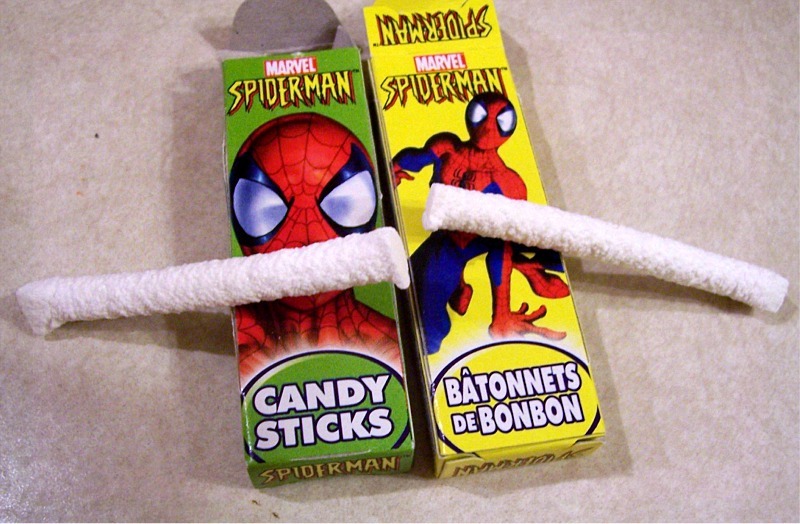 We used to chew that stuff all the time. Right. When we’d go fishin’ down ta Sutter’s Pond. Darn stuff tasted kinda like peppermint. It was awesome. Any beverage that can make a couple of ol’ timers go back to their youth and romanticize is a winner in my book. Anyhow, I bought the soda and took it out to my car. The bottle made the customary HISS as I turned the cap. I sniffed the bouquet like Paolo Basso, drinking in the aroma, searching out its subtleties. My first sniff put me back on the stage, face coated with pancake makeup, eyes squinting from the spotlight. Could it be? Yes! It smelled like Necco candy cigarettes. Tentatively, gently, I raised the mouth of the bottle to my lips, and sipped. I smacked my mouth, allowing the air to mix with the beverage. Nirvana! It was the taste I had been looking for – that strange, minty subtlety; that delicious fresh aftertaste. All that was missing was the satisfying CRUNCH of the candy, but I could live with that, if I had to. When I got home, I scoured the internet. Now that I had found my grail, I never wanted to be apart from it, again. 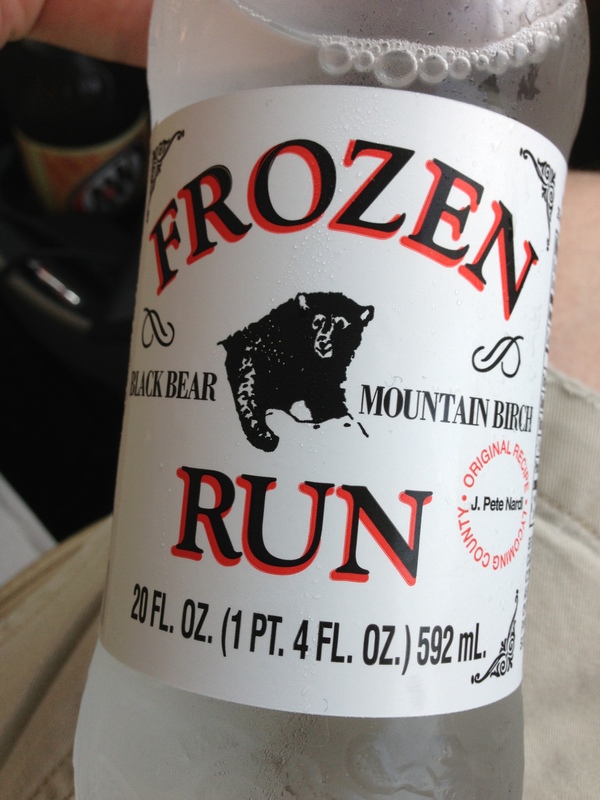 My case of of Frozen Run arrives this week. 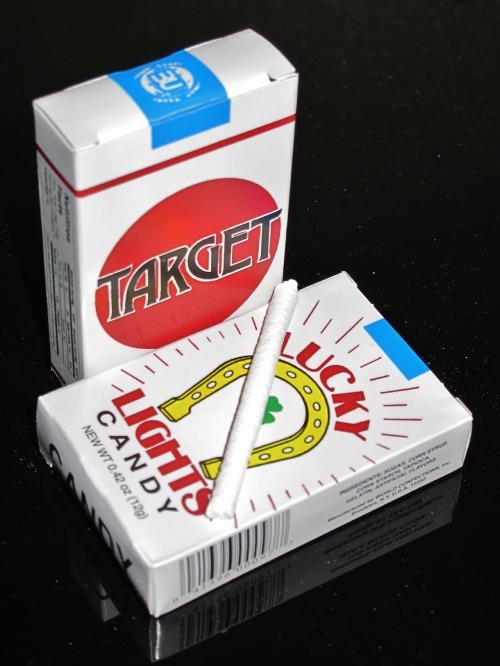 I am still on the hunt for Necco Candy Cigarettes. This Post was posted in Uncategorized and tagged bear, beer, beverage, birch, bottle, candy, cape fear, cherry, cigarettes, delicious, dinosaur hawk, drink, frozen, frozen run, gas station, grizzly, lion, necco, nick nolte, ol', old fashioned, old timers, peppermint, pink, play, pop, refreshing, rehearsal, run, smokes, soda, sticks, stix, supersonic, theater, travel, white. Bookmark the permalink. It’s such a shame. Maybe Necco will bring ’em back in candy stix form. . . I can always hope. The Frozen Run is worth checking out. I think you can find it in cans on sodafinder.com. This is my favorite soda. Found it in the middle of Pennsylvania in 2002 and again in 2004. Where did you find it on the Internet? I actually didn’t find it on the internet, I too, discovered it in the middle of Pennsylvania. Although, I have heard you could order it from different venues, online. The pop is almost impossible to find online, & if you do, you’ll pay a fortune for it! Of course it’s worth it, but it’s still more fun taking a run back to PA to find those small gas stations & “old-time” stores that sell it! And I believe there is a little store off Rte 119 in Mt. Pleasant that has the candy, too! Nothing better than old gas stations and regional treasures.